Do you find yourself searching for a party bus in Brownstown? If so, then we are pleased to announce that your search has come to an end. Here at Rockstarz Limousine and Party Bus, we specialize in not only delivering an amazing time for you, but provide you with so many cool memories that you will wish you had explored a party bus earlier. 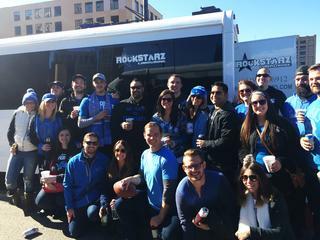 Whenever you are looking for a Brownstown party bus rental option, then you will clearly want to be sure that the bus is able to accommodate a number of guests at any given time. Well, with us, we have sought to make the maximum possible use of the space available, meaning you can invite more guests than ever before. When you throw in some luxurious leather seats, then you have the perfect setting for the perfect party. Of course, when using our Brownstown party bus service, you will be concerned about the atmosphere, but there’s no need to worry. Not only do we effectively turn the bus into your own private nightclub, but we also include a stunning sound system and laser light show that will simply add so much to the overall mood of the evening. Previously, individuals have sought to use our party bus in order to celebrate a number of different occasions, and we are happy to accommodate you no matter what it may be. From a special birthday, to an anniversary, or perhaps you are simply getting married and looking for a rather cool place where you can let your hair down for one last time. The choice is really up to you. So, if you live in the Brownstown area and are looking at renting a party bus, then give us a call here at Rockstarz Limousine and Party Bus. Alternatively, you can contact us via our website and someone from our team will be in touch to discuss your requirements.